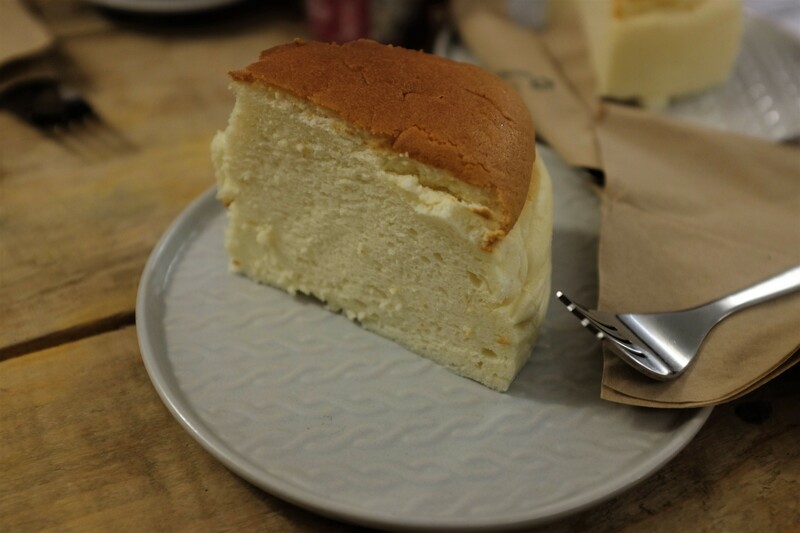 There was a lot of talk of wibbly wobbly cheesecake, otherwise known as Japanese cheesecake, amongst our group of friends in advance of a trip to Crushed Bean in Croydon actually happening. They only tend to make it on a Saturday and we heard it tends to sell out super early but we were not expecting to get the last two of three slices just after 10am so were delighted we all managed to get down there early to tuck in! It was my first time visiting Crushed Bean but a lot of people and friends recommend it highly for the food, drink and the atmosphere thanks to friendly and knowledgeable staff behind the counter. On entering the cafe the first thing that struck me was how small the food preparation area is as it is all on show and a similar size to a galley kitchen; but with a coffee machine and a number of other gadgets to allow them to cook and prepare a handful of different dishes it seemed like an impressive challenge to undertake daily. 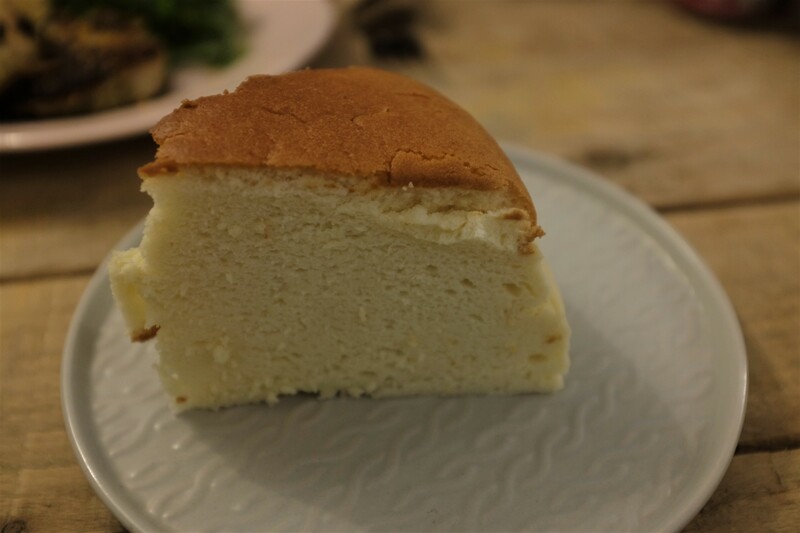 The cheesecake itself, from a glance at least, looked to resemble a very light and fluffy vanilla sponge cake. On closer inspection it was clearer to see the air bubbles and that the texture was not a crumby one but rather a more continuous layer of cake that when you moved the plate or gave it a little prod there was a mild jiggle. As the cake had been made and allowed to cool and set for a while it has ‘deflated’ a little and was not at peak wibbly wobbly stage but it still looked very interesting. With regards to the flavour of the cheesecake itself it was certainly on the subtle side and there was a hint of what I can only guess was vanilla. Baked cheesecakes have a very gentle flavour in general, unless loaded with fruit or other things that also tend to make it really dense, so I am not surprised this was low on the impact flavour front but it was still yummy and an enjoyable experience to eat. There was a number of different options for food when we went in there but again this was limited in terms of the portions that they would be able to make up; a result of a small kitchen means small storage space for ingredients and that it depends on what they are able to get hold of each day to the quantities of certain dishes they can produce. Whilst this can make it a little hit and miss in terms of what is on offer when you step inside it does also mean that you are going to get offered different things each week, or at least some variety each week, especially as the seasons and what is freely available to purchase for ingredients change. After a moment of standing around and deliberating what to order, before heading to the extra seating in the basement below, I finally decided to go for a banana bread that had walnuts and a few other bits loaded inside as well and a cup of green tea. We then headed down to the light, airy and spacious basement that had a variety of wooden tables, benches and sofas as well for individuals to groups to sit down. They welcome dogs too so there was a very lovely dog sitting near us! As we got comfortable were chatting away the drinks and food made its way to us on a variety of crockery. usually different style of crockery in a cafe or restaurant tends to annoy me a little but it really worked in Crushed Bean. I think the way that they are different styles but also consistent in terms of warm/heated foods being on pink plates, cakes and pastry style items being on grey plates and then cups and saucers all being deep blue with white rims and I think that is what makes it work well. When the bread arrived it was mildly heated but not to the degree of calling it warm. It was just a level of being heated that made it the perfect temperature to smoothly spread the coffee butter across. Usually I shy away from anything coffee flavoured but the flavour mixed with the type of butter they used allowed for it to be a good hit of coffee without being overly bitter or overpowering to the rest of the ingredients. The dish itself was flavoursome, well textured and moist without being too heavy or overwhelming; it felt like the perfect sized dish and weight to have as a brunch item and not feel guilty about it being essentially a slab of cake (masquerading until the title of bread, let us be honest). 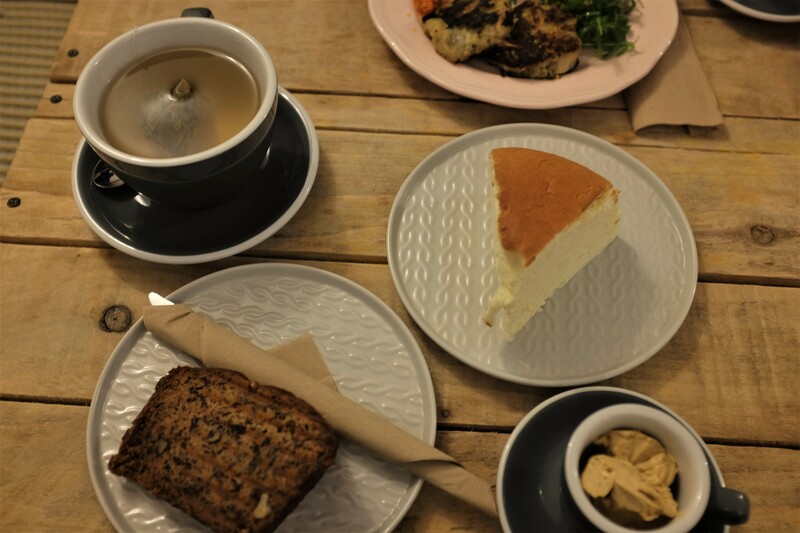 It was a great first visit to Crushed Bean and I would certainly be happy to return there again in the future and to consider recommending it to other people should they be looking for a cafe suggestion in Central Croydon. The price of each of the items was not too steep and came in at a pretty common point for dishes from independent cafes in and around London (the bread was just over £5). The vibe was really enjoyable as well and that was massively helped by the layout and the attitude of the staff as they brought everything to the tables and allowed everybody in the cafe to go at their own pace without rushing anybody to get maximum table turnover and this is something I hugely appreciate and feels deserves a shoutout. This entry was posted in Food and Drink, Restaurant Reviews and tagged banana bread, breakfast, brunch, cheesecake, coffee, coffee butter, croydon, Crushed bean, food, food blog, food blogger, food bloggers, green tea, independent cafe, japanese cheesecake, lblog, lblogger, lbloggers, life, Lifestyle, lifestyle blog, lifestyle blogger, lifestyle bloggers, meal out, restaurant, Restaurant review, review, tasty, weekend, weekly menu. Bookmark the permalink.